I think that Elvis was my first love. I was 5 years old in the 1950s, and I sat in the sun on the living room floor with my legs criss-crossed, album cover on my lap, in a pool of light from the leaded-glass window near the fireplace. Motes of dust bounced and drifted in the beam of sun, fairy-like. 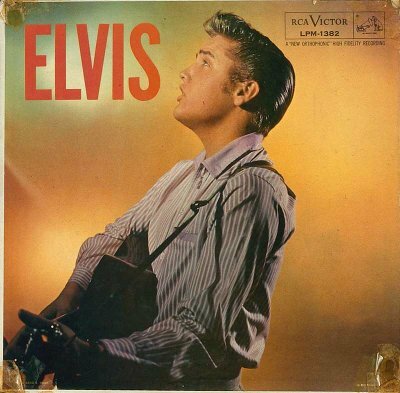 The sun shined on Elvis Presley too, on that cover; guitar strapped across his stripe-shirted shoulder, as he gazed upward into a faraway sun, or maybe into the light of Heaven itself. I was besotted by such beauty in a man. The errant forehead curl, the pull of his lip that made the tiny sneer; imperfections that rendered him more beautiful. The sun was golden and Elvis was too. Yes, he was tawny then from a life in the Delta sun; his hair a slick, golden crown. This was years before his hair was dyed black for photos and film, and later, to hide the signs of time. Oh yes, back then, as I gazed at the album cover in my living room, he was a golden boy. He is Elvis, the light shines on him, and it shines on me. There is a familiarity about him, a softness of speech and manner that is not unlike my own Southern father and uncles. There is none of the frantic crispness, the stiff, staccato notes of the North. No, his way is soft; he moves more like folks move in my world. I am 5 years old, yet I know this. There is too, an oddness about him, something untold. I learned later of a twin who died still born, and oh, the mystery of that child unknown. Another Elvis in the world was too much to contemplate. Maybe the spirit of the long gone child made Elvis become more than if they had both survived. His too lush beauty hints, to me, of long-lost secret ways, his eyes too heavy, lips too full, the nostrils spatulate. I wonder just what other blood flowed in those Delta veins, what long ago dark ancestor through him sweetly sang. My daddy was a record shop man. Produced, wrote, recorded, pressed, published, and sold records. Growing up, I was surrounded by records, and as a child, I read album covers and liner notes – my earliest history class of the world and the people in it. Our house was full of records, 45′s, 78′s and the new “LPs”. Records were recorded even in our living room, the high, oak-beamed ceilings made for great acoustics. There were records all around – Stan Kenton and Oklahoma! and Bobby “Blue” Bland and Jerry Lee Lewis and Louis Jordan and Dinah Washington and Chuck Berry and Carl Perkins and Howlin’ Wolf and Peter and the Wolf and Mahalia Jackson and Tennessee Ernie and Ike and Tina and…., well, a whole lot of albums were in our lives. But the Elvis album cover I will never forget. Years later it would be said that Elvis was a thief, a robber, a usurper of the music of others. But I think not. The men I knew, Black blues-loving Detroit men who lived in the North and hungered for their South, looked at him with the bemusement of affectionate elders, as if one of their own had played a trick on old Jim Crow. “Listen to that boy” they’d say, and shake their heads, “just look at him”. He was as familiar to them as sugar cane and red dirt. They knew just where he came from, just what kind of church he must have sat in as a child, by the way he played a chord, or sang a note. They knew he’d seen that Holy Ghost grab someone and make them whoop and holler, in the churches of mothers’ boards and deacons, the churches of the gospel shout and stomp. Wasn’t his fault that there were those who made money off of the music of others, that society let him bust through musical doors that barred his darker brothers. He let rhythm music come through him, past the restraints of upbringing and environs. He didn’t turn our music white, but worked it through the channel of his own Delta life. Though how tortured was his wrestle with the secular and divine; oh, how tragic was his price. I miss Elvis, even the jump-suited Las Vegas Elvis, the latter-day bloated and drug addled Elvis – yes, the eternally impersonated Elvis. But most of all, I miss the Elvis on that old album cover – the striped-shirted, tawny-haired, golden boy Elvis; with a profile as chiseled as Michelangelo’s David, his face as angelic as Gabriel, eyes raised towards Heaven. He’s the Elvis in my living room, with the sun shining on him, and shining on me. [Every few years, I get deep into what I call my Elvis Studies; an odd preoccupation, one might say, for a dread-locked sistah like me. When I wrote this piece, I had just finished the two–volume masterwork by Peter Guralnick, “Last Train to Memphis – The Rise of Elvis Presley”, and “Careless Love – The Unmaking of Elvis Presley”. Together, they constitute a monumental biography, an awesomely – even absurdly – detailed account of the life of Elvis. Then I topped it all off with Priscilla’s “Elvis and Me”, a boiling confection I’d been avoiding for years. So after I finished this course in Elvisology, a few years ago, on the anniversary of his death, I wrote this piece. Btw, this was one of my submissions for the Kresge Fellowship in the Literary Arts, which I was awarded in June, 2012. Categories: Musin' on Music | Tags: black church, blues, Elvis, jim crow, joe von battle, rock 'n roll, segregation | Permalink. Thanksamillion for such a refreshing, and very fair viewpoint. Informed Elvis Presley fans know well Elvis was/is admired by a great many black artists. Many of us Elvis fans greatly admire a lot of black artists too. I had laugh about Elvis with gentleman, Domingo Samudio (Sam the Sham), in the Blue Light Studio in Memphis August 18th 1997. Greetings you in Ireland! Thank you for looking in, and considering a different view of this man. Yes, many blacks loved Elvis, from artists, to “regular” people. Elvis fans on quite a few Elvis Forums are now enjoying your fine piece of writing. I shall certainly spread it around elsewhere. I’m a dedicated busybody when it come to music. Whether Tina Turner, The Platters, Kate Bush, or the great Beethoven. What a lovely piece. You have articulated so well what so many feel about the man & his music. Great to see the love being spread on here! TCB Elvis fans! Thanks! Yes, I Love Elvis! Like many, many African American music lovers. Thank you for sharing such a beautiful and heart-warming piece of writing from a black Elvis fan’s perspective. I, too, am of color and have loved Elvis for over forty years and whenever I read about other Elvis fans of Color, especially African-Americans and their love for Elvis and how he touched them through his music and persona, it all the more reason brings such a wonderful and heart-warming feeling within me. Thank You and may God’s Blessings be upon you. ArunJassi, thank you for your comment. I think Elvis was awesome and a lover of our people. Many will agree. Thanks! This is a beautiful and intelligent piece of writing, thank you. You have captured the absolute nonsense of the “cultural thief” lie and presented Presley as an artist. This should be required reading for all students of modern culture. I thank you so much for your kind words, and for “hearing me”, Tony. Thank You for this great & touching piece of writing. I’m a (former?) ghetto hillbilly who grew up in the Cass Corridor & Van Dyke & Kercheval area of the D in the late-’50s thru the mid-’70s (then moved to Chicago & eventually NYC, where I’ve lived since the mid-’80s). As a child, I had the dual soundtracks of R&B/jazz & the hillbilly music my parents/family back in W. Va & Tenn listened to playing in my head. Even back-in-the-day I understood the connections between those & other genres of music & am so happy to run across a fellow Detroiter who so articulately expressed this very American mix/esthetic in such a personal way. I look forward to investigating more of your writing. Aw, thank you Billy! It is nice just reading your post; your mention of those Detroit streets certainly resonates with me. I appreciate your kind words and yes, I do have a sense of the connection between those genre’s of music; especially when played back in the day in Detroit when the factories and communities were bustling with Southern Blacks and Whites. Bless your heart…. Thank you for brightening my Monday. Will be reading more of your essays. Oh my goodness. Thank you for your kind words, and especially, thank you for your blog post – it is wonderful! It’s funny how we have a similar way of viewing Elvis – and even a similar “voice,” in the way that we write. I loved it. I am fascinated by the early years of Elvis, and you captured the fact that he was “different.” Different meaning much more connected with his black neighbors, and his own desire to be like them, which was shocking in those days. It is hard to tell these days, but back then, Elvis’ way of dress was BLACK, he was very disturbing to whites in his life. I love the interviews I’ve seen with the owner of the men’s store where he shopped – Lanksky? He too had absorbed and affected a black way of speaking and dressing, and he was so compelling, talking about Elvis back in the day. I’m going to add you to my blog links Glenn. Thanks for reaching out.